How do I use the collapse effect? Where can I download the collapse effect? 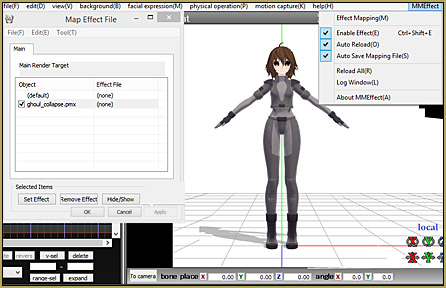 How can I make the collapse effect work in MikuMikuDance? The Collapse Effect; How do I use it? So, Yuuki, what’s it about this time? Hey guys; Long time no see!! Do you not… remember me? Whoa, super rude! 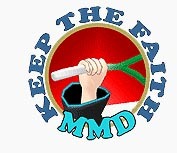 In case you don’t know who I am, I am a new edition to an amazing group of MMDers like you! My name is Yuuki, and this is my second article you’re reading as I type. My first one was about the Light Manipulation Panel, and how you can use it to easily make your pictures and videos look cool! This one is on the collapse effect; I mean, that’s why you’re here right? I would also like to note that if you’re confused as to how PMX works and if you’ve never used it before, then… that’s completely fine!! Make sure to follow me and how I use it so you can get the job done! Also, I will answer some questions at the end of the article, so stay tuned if you screwed up and need assistance! Well, let’s get started shall we? Well, the collapse effect makes your model disappear into nothing basically, as if it was slowly fading away. An example is below, because I’m a magical person! The Collapse Effect can give your images many amazing looks if used correctly, and it can easily be added onto anything that is a PMD, PMX, or X file. So basically anything you can load up into MMD and PMXEditor. So, now we can begin on this tutorial, right? Alright, it’s not much; just a few things you need to make sure are done and a few things you need. 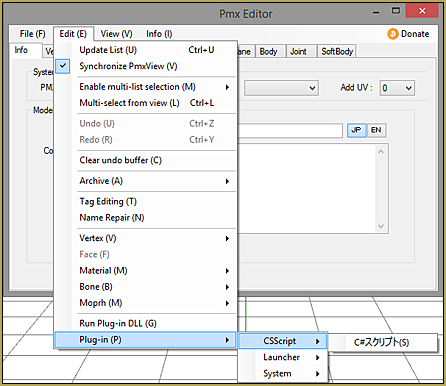 First, you will need to make sure you have PMXEditor (check that off the list) and MMEffect. Also, I’d highly suggest having the newest MikuMikuDance. Don’t know where to get that? Check out the downloads on this very site to get the newest version!! YOU GORGEOUS READER STOP WHERE YOU ARE!! DO NOT GO DOWN! PUT YOUR HANDS IN YOUR LAP! Before you continue, change your local settings to Japan or it will not work!! To do this, go to your control panel > Clock, Language, and Region > Region > Change Location. Then click ‘Japan’ in the list and apply the change. Okay, you’re done. Sorry if I frightened you small child. I only wanted to protect you. Well I can first suggest you stop poking it!! It’s not magic ya know?! Geez. I can guarantee that it’s not as simple as loading it in the accessory panel or loading a .fx file into the MMEffect tab; it’s not that difficult either though. 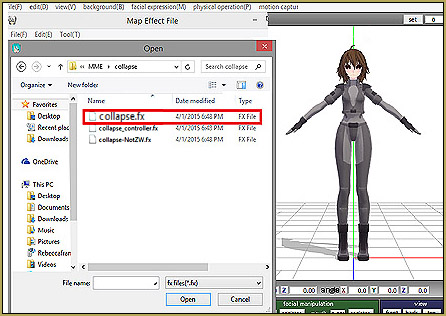 We are going to modify your model’s files so that it can “do” the collapse effect. Anyways, load up your model in PMXEditor. FIRST THING, do a SAVE AS and save a copy of your model with a new name… like CollapseMiku.pmd, or something, so that our changes are not made to your original model. Alright, now go to Edit > Plug-In > CSScript > (S). Just press the button with the ‘S’ in parenthesis or just ‘S’ for a shortcut. 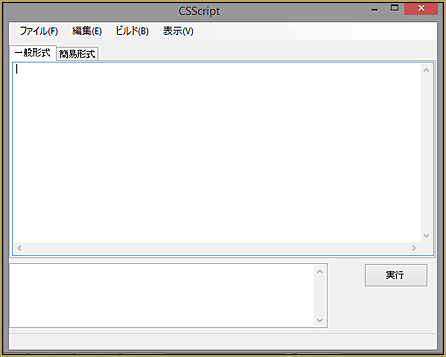 After that, a small window will open that should say ‘CSScript’ If you’ve used PMDEditor, this will be super easy for you! Please make sure it does not say the words, “NOT” in the file name. Even if it’s gibberish or actual Japanese characters, you can still see that word in the name. I’m not exactly sure what it does (go “YOLO!” and load it if you wanna) but to use the effect, you CANNOT load it. So after you load it, a LOT of text is gonna pop up in the big box. Like, a lot. Just promise that you won’t mess with it okay? Mainly because you don’t need to mess with it! Just simply click the button and SHIZZAM!! Magic. It will take a while to load though (depending on PC speed and just how long it loads) so DO NOT close out of it no matter how long it takes. Even if it is not responding!! So after it loads, it should have text in the bottom box. Then close THAT WINDOW ONLY. Make sure when saving the model, that you are saving that copy of the model, like CollapseMiku.pmd in our example, not your original model. ‘Save As’ that new one instead of ‘Save’ over the original model. You wouldn’t want to save over the original model; not because it would mess it up, but because if you wanted to use it and not have the collapse effect affect it but rather things around it, you could load the original back up. If you opened a .pmd model file, save it as .pmx if it is not already set to do so. 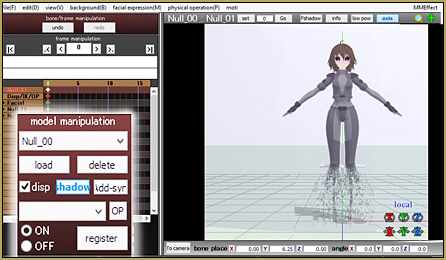 NOW you can close your PMXEditor and open up MikuMikuDance! Yay!! Now this part is pretty easy, so sit back and relax as I go step through step of this part with you. 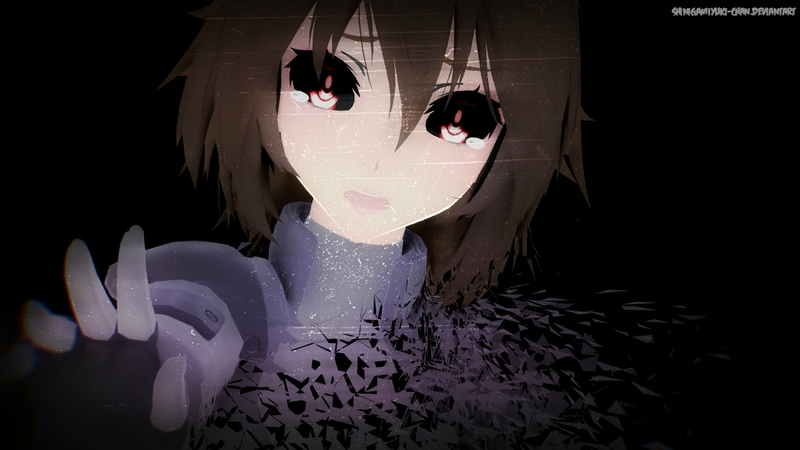 I loaded my model in MMD. Now what Yuuki-chan? Please don’t go all Honey-senpai on me now (No OHSHC fans? No? Okay bye)… Well, now you load up your new MMD model silly!! Isn’t that a little obvious? It’s not like your hacking a high security program or something. A quick note: according to some people, some model’s textures get all funky when they load the model they edited for collapse. 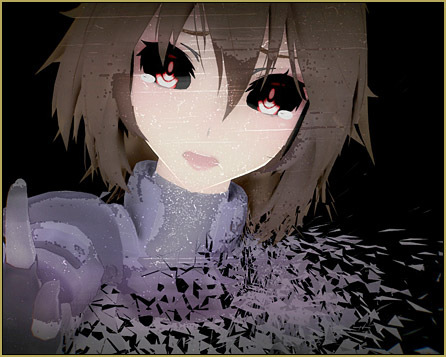 Don’t worry about it and do not close your MMD window! This might happen but once you load your effect onto the model, it will be back to normal. Once you do that, please make your way to the collapse effect folder and load the collapse.fx file. After that of course, click apply and close the window. Then, throw glitter everywhere and put on a party song, cause it’s one step closer to using the collapse effect! Move the Collapse bone around and BOOM!! Just move that around and you’ve got what you wanted! To get it a certain way that you want requires patience and moving; also registering the bones so you don’t lose your progress. 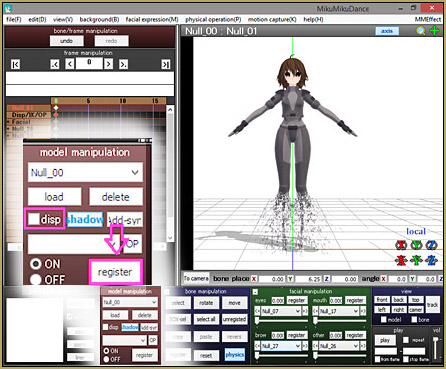 Also, if you don’t want that other stuff to show up (the controller the other things) Go to the model manipulation tab and click the “disp” (display) option and register. Alrighty now; Q&A/ solving problems time!! Q: My model is all white. Help? A: You need the newest version of MMD OR you saved the model in the wrong folder. Save the model with the effect in the same folder as the original model. Q: It doesn’t work. Help? 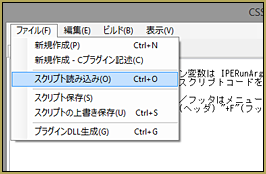 A: You need to change your country settings to Japan, as shown in the video. Q: Everything is done correctly, but it still won’t work! Help? A final note: The ReadMe included with your Collapse Effect download indicates that there is more TO this effect than just using it like we did, here… things like using subset-extract to have the effect affect only PARTS of your model… I tried to make an English translation of the ReadMe using Google Translate… and have it HERE for you. It is, as usual for a Google translation, in broken English… but you can work out the meaning of it. It seems that the youtube video in your tutorial is unavailable. Can you please renew the dead link? Sorry… it really IS gone! … nothing new to replace it, yet. Quick heads up, some models can be too heavy to load the effects on. For your everyday model this is no problem, but any heavy/complicated models may be. I had some super detailed wings I tried this on, and it crashed my PC, even though it works fine on my human models. Careful if you wanna do what I tried unless you have some sorta government supercomputer lmao. Well First I did What Was Right But I Kinda Put The Folder And Effect Files to English.And then i Tested out The Effect And IT WORKED.But One little Problem….Im Realizing That The Effect Doesnt Make the Model Wash Away Like Sand in the Picture…Help? What type of model did you got it to work? it don’t work for window 10 are you serious??? what can i do now? I’m just going to point this out for those who say nothing worked. The effect probably won’t work for Windows 10, since the Plug-In button remains greyed out, even if you did change your location. Would you please elaborate on this? I don’t remember anyone in the LearnMMD staff having Windows 10, so we can’t verify it by experimenting… and this looks like important information. Thank you. 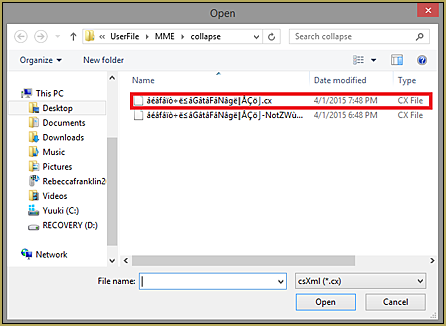 I’m using Win10, and I’ve successfully used the collapse effect. Not sure what Starmoji’s issue is. you did? please help me out! i follow the rules but it said it doesn’t work! It’s been a while, I don’t remember. How was it exactly that it didn’t work? Was there an error message? The plug-in button was greyed out. Even when I changed the location. Did everything right, ehh? … “:o). … Do other effects work for you? i fixed my precious problem by getting the japanese pmx but now when i try loading the effect it says its not even an x file.. what do i do? Not every effect is loaded as an accessory (to be more precise, accessories are *not* effects at all, only attachment anchors for them). This one is loaded as a model, using Model Manipulation panel. emma’s situation is the same as mine…please help. 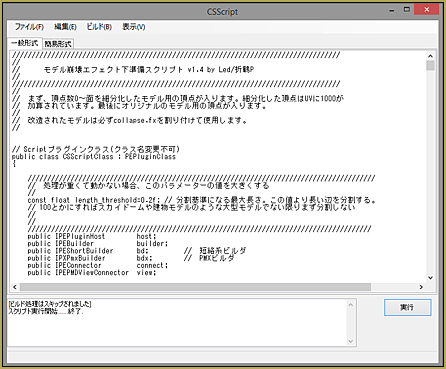 it says “failed to draw initialization” after the collapse effect is added onto it in pmx editor. Please describe *every* step you make in order to use the effect, and whatever reaction you get after each one. but you put the download or not ?! The download is in the article… one of the headlines, in fact. I’m having a bit of a problem with this effect. 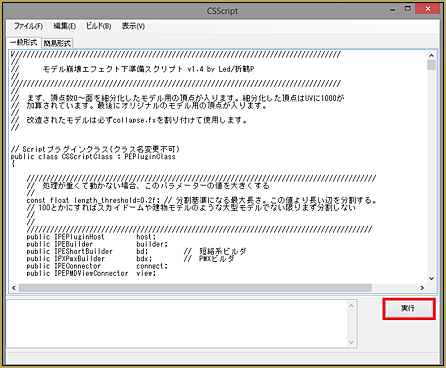 I followed the instructions exactly, but the model somehow gets completely messed up after the step where the CSScript is loaded, like if it was changed from a .pmx file to .pmd. I have set up models for this effect without any problems before, including ones made by the same artist. Do you know what might be causing this? I haven’t the slightest clue as to what it could be, but I will try my best to figure it out. When I do (or if I can find something) I will contact you. What does the model do exactly? The model turns into a squished mass floating where the torso would be, stretching to where the tips of the fingers should be. The bones are untouched, and probably also the physics (I haven’t checked those). It seems to just affect the visible parts of the model. Just to check: in Regional Settings of your computer, do you have set dot for decimals and comma for digit groups, and not vice versa? Yes, dots are set for use in decimals and commas for digit groups. I don’t think that was the problem, though, as the effect did work on other models. I ended up taking screenshots of the problem, just in case they were needed. If you think it might be helpful, can you let me know so I can send them? I have a question! I went into PMXEditor and I dont have the plug-in slider! What do I do? I just sent you an email… let’s figure it out.